Sadly, the old adage that “the more things change, the more they stay the same” seems to aptly describe Harvest. Yes, there has been change. But none of the change seems to have transformed Harvest’s diseased culture. Church leaders refuse to own much of their sin, and repent of it publicly. Leaders continue to try and hide the truth.The pulpit remains a means of manipulation. And stunningly, old, disqualified elders are being used to pick a supposedly new and improved elder board. In January, Harvest and MacDonald dropped their frivolous and unbiblical lawsuit against me, the authors of The Elephants Debt—Ryan Mahoney and Scott Bryant—and their wives. That was a welcome development, but two major issues remained. One, the lawsuit cost the Mahoneys, Bryants, and me tens of thousands of dollars. And two, the lawsuit itself (and accompanying elder updates and comments to the media) included outlandish lies about me and the other four defendants. Recently, Harvest reached an agreement with me that included the church paying for all my legal fees, including an additional $15,000 to compensate me for the defamatory comments MacDonald had made about me on the recording aired on Mancow’s radio show. Scott Bryant told me that the church also has settled with him and covered all his legal fees. For these developments, I am grateful. I appreciated the elders’ sentiment. However, I told Nudo that for the elders’ apology to be meaningful, the elders would need to publicly renounce the lies they’ve published about me. Nudo responded that the elders would be in touch with me after considering the issue. That was two weeks ago. I have heard nothing from the elders since. Meanwhile, the Mahoneys remain in litigation with the church. They have filed a motion for sanctions against Harvest under the Illinois Supreme Court Rule 137. This rule allows a party to recover attorney fees spent defending frivolous litigation. As part of the Mahoneys’ litigation, their attorney sent me a subpoena for audio of a recorded conversation involving James MacDonald, as well as a transcript of that recording. This is something I have never published for legal reasons. But it is something that is of significant public interest and is relevant to the Mahoneys’ case. Yet as Harvest has done before, the church predictably did again, filing a motion to quash the subpoena so this information never becomes public. So much for Harvest’s alleged new era of transparency. Now I just want to suggest, “I promise I will not bring up this incident” and “I promise I will not talk to others about this incident”—that rules out social media. Listen up! Social media has become social mania. Blogging has become flogging. Tweeting is now beating. And Christians are doing that against Christians! If somebody does you wrong, you don’t go home and post about it on Facebook for your 1,000 friends so it’s out there forever guys. It’s just wrong. That’s sin. It’s called slander. It’s called gossip. It’s called something we ought never to do to one another in the body of Christ. And, oh my goodness, how we’ve gotten out of control with that stuff! We have to learn to forgive. Given normal circumstances, what Vanlaningham said might not have triggered backlash. However, these are not normal circumstances. For years, Harvest leaders have shamed the congregation from engaging in social media—or reading blogs exposing corruption at Harvest, like The Elephant’s Debt—saying to do so was gossiping and sowing discord. Granted, the specific issue Vanlaningham addressed was publicly posting about a personal offense, rather than a public offense like corruption at Harvest. Yet given the context of past shaming, what he said, which lacked any clarification or nuance, felt like the familiar urging to turn a blind eye to the online exposure of ongoing corruption at Harvest. The audio of that sermon is no longer available online, but below is a short clip from the sermon, which includes Vanlaningham’s request. 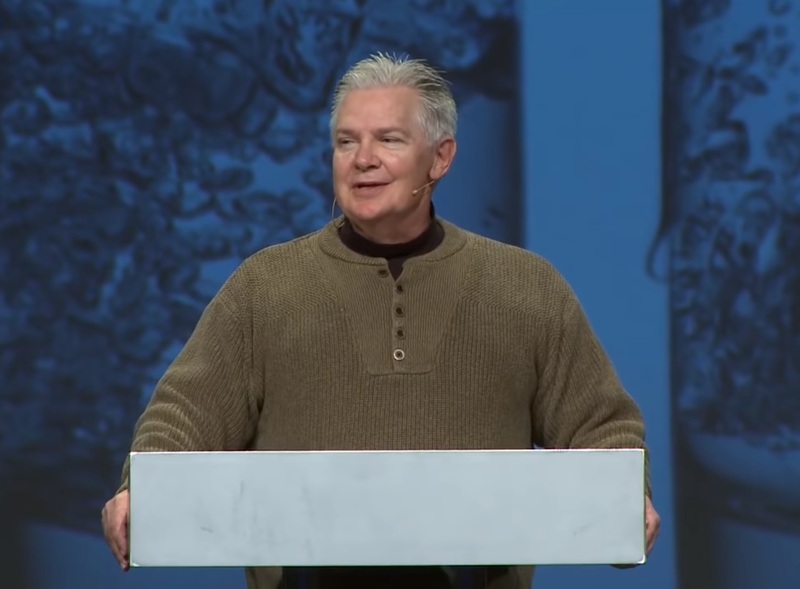 Also, here’s video of the sermon Harvest posted online. The part about social media can be heard from 27:21 to 28:22. Again, under normal circumstances, what Vanlaningham said might be acceptable. But given the pattern of control and manipulation at Harvest, it was unwise at best—and at worst, a sign that the old, manipulative patterns remain. Also, Vanlaningham makes a very disconcerting statement near the end of his sermon. In this statement, he addresses public discussions about Harvest. And then he conflates the public criticism of the church—which almost exclusively has targeted corrupt leaders—with the congregation itself. I was dumbfounded when I heard that. With these statements, Vanlaningham essentially created an “us-them” scenario, where the congregation and Vanlaningham—“us”— is being abused by “them”—the outside bloggers and social media users. But the reality is that bloggers and social media users aren’t abusing the congregation; Harvest’s corrupt leaders are. That is the “them” Vanlaningham should be calling out. Instead, he continues to point the fingers at outside critics, as though we’re the problem. That’s false and it’s wrong. I have reached out to Vanlaningham for comment, but he has declined to say anything on the record. That really saddens me. Less than a year ago, Vanlaningham was a professor at the Moody Bible Institute and a repeat guest on my former Moody Radio program, Up for Debate. I really respected him during my time there, and this is not a message I would have expected from him. Lastly, there’s the matter of elder selection. As I’ve already mentioned, the elders currently running Harvest are the same ones responsible for approving the gross financial mismanagement there. However, Harvest says it plans to have a new board in place by the end of May, so does it really matter? Actually, it matters greatly. These men shirked their fiduciary responsibility and have a strong interest in keeping Harvest’s financials hidden forever. Why the church would continue to allow them to have access to these documents, let alone control the direction of the church, is beyond baffling. It’s no wonder that Harvest still has not opened its books nor revealed the compensation it paid James MacDonald and former Harvest executives. And, though it’s extraordinarily unusual for an auditing firm like Plante Moran to refuse a job like auditing Harvest, given the circumstances, it makes sense that it did. There also are seven former elders serving on the elder selection committee. And of those seven, six signed the infamous letter last December pledging “unconditional support” for James MacDonald. That letter has since been removed from Harvest’s website but is posted below. These disqualified men—Jay Patel, Elvin Valez, Mike Lawson, Ron Frahler, Jeff Kee, and Joe Brightwell—should have zero input into the selection of new elders. And it’s shocking that Harvest would elect a “new elder board” using old, disqualified elders. But once again, the more things change at Harvest, the more they stay the same. Here is the application elders were sent. There’s much that’s worthy of comment in it. But for starters, it asks applicants whether they are tithing to the church. Normally, I would say tithing is a prerequisite for being an elder. But until Harvest opens its books and proves it has solved its mismanagement issues, giving to this church is irresponsible. I wonder if those prudent members who stopped tithing to Harvest were disqualified? I have emailed Harvest’s elders and asked questions about the process, but they have not responded. It is interesting to see the opposition to keeping people honestly informed. I get that none of this is comfortable and I get that anybody might prefer a different nuance here or a different slant there but it is a gift to the church to have competent reporting of things that are of interest to the entire church and that should not be deceptively hidden. Julie, your articles have provided me with spiritual discernment when choosing a church. I have attended a Harvest Bible Chapel in an Eastern state. I was asked to meet with an elder to immediately become a member after attending for only two weeks although their written membership policy stated a three month attendance history prior to membership. In addition, I was asked to begin helping with nursery at that time once a background clearance was completed. I felt it was a little premature and disconserting to think that other members may have had the same level of nonchalant screening prior to nursery duty without an outside character reference. I believe church membership and involvement are important (Ephesians 4:11-13) and a calling from God but is also important to learn the true character and spiritual maturity of Christians prior to placing them in positions of leadership. Your articles have recounted what can happen when leaders are promoted before Spiritual maturity and their character assessments are not throughly examined. Although I believe many of the members of this particular church genuinely desire to follow God and scriptural teachings, I did not have peace about becoming a member in light of all the information I have learned through your blog and the Elephants debt. Thank you for having the courage to warn the body of Christ of potential pitfalls. I know that you have faced and continue to face opposition while you are presenting this information to the public but please know that strangers, fellow believers are praying for you on the east coast. Where is that in the bible? It is not and neither it is a prerequisite for being a Christian. All cults and quasi cults claim the opposite. I have pretty much renounced Christianity, so your Bible verses don’t apply to me. Did the man child named Little Jimmy really think suing a JOURNALIST would be successful? I can see the possibility of volunteer webmasters caving in, although they didn’t. But a real JOURNALIST? TED hadn’t posted anything new for quite awhile. But I can picture Little Jimmy sitting in the basement of his $100,000,000 house (hyperbole) with smoke coming out of his ears, scheming to get even anyway. And Little Jimmy saw a sucker in Mancow. Hahaha. “Hey, I don’t bother with the clowns in the aisles, but you’re a big time dj with money. We can really USE you. Let’s be buds.” I can picture that conversation. In fact, I am laughing my donkey off. I love this. So does satan. Satan here! Did Harvest’s boy reveal how much Harvest pays him? Most of the people trying to save this cesspool are on the payroll. Just to clarify , you did mean the harvest boy and not yourself when you said and I quote “Satan here!” ? What a mess all over North America isn’t it? The desire to share a little of my 35 year “truth” journey with you is quite strong concerning my observations of what Christians call church of which I was apart of until just last year. which we Christians some how equate to coming out of world and going to church, which would be ok except today’s church is still the “world” (system) which is mammon in the KJV. Jesus Himself said clearly in Mat 6:24 ” You CAN NOT serve God and MAMMON” (world system). Does the church today for the most part look,smell,act, sound like the world today? It does if one separates themselves from it and can begin to hear and see correctly by being OBEDIENT to God’s Word and TRULY having the SPIRIT of TRUTH operating in one’s life by being OBEDIENT which is the opposite of sin. OBEDIENCE shows the action to God that one is serious and not just playing…… church whoops sorry that just slipped out. The next piece of Word that came to me is this: Mat 7:14 ” Narrow is the way which leads unto life eternal and FEW THERE BE THAT FIND IT”….. well that really really snapped me to attention BOOM! Did not I read this 100 times before? 4) What does FEW actually look like? One thing I’m pretty sure of is that it does not look like 12000 people on a weekend sitting in front of the paid HIRELINGS of harvest or anywhere else HIRELINGS are being paid even a $1 to do God’s service. Off the whipped to raw meat back of our Messiah. HIRELINGS care NOT for the sheep, Jesus said it. If somebody thinks it’s okay they are deceived and in the system. 7) There is no fixing something that is not suppose to exist according to God’s Word. Where did He ask anyone to build ANY of this? He didn’t , do the studying of His Word and find out!! So I wrestled for a year or so , I didn’t dare say anything to anyone cause I would be a heretic of some sort at the very least…….. oh well ….. jimmy boy certainly isn’t the answer that’s for sure and by their fruit you shall know them….. so here goes- the disciples were called “Christians” YEARS after Christ walked and died and resurrected, could it be just another NAME perhaps even the start of the first denomination so to speak? Why not? I found that it IS a possibility and becoming more true as months go by concerning the behavior of North American Church and “leaders” everywhere, no HIRELINGS actually. Does anyone realize that there are over 40,000 DENOMINATIONS in this world! There is ONLY ONE NAME and ONE VOICE that we should believe , the one true great Shepard. Whoops …. I mean Shepherd ! Someone needs to ask Mikey Vanlaningham how much he’s being paid to put forth this propaganda. What an absolute disgrace.